The Soondra Foundation provides healthcare access through micro-grants to the working poor in India when they have a medical emergency. For the Indian working poor earning $3-$5/day, an unplanned health crisis can create catastrophic medical debt. We address long-term economic consequences in the face of medical emergencies with timely micro-grants. We partner with established Indian nonprofits who vet the grantees using our guidelines and disburse the funds directly to medical providers. The Soondra Foundation does not provide funds to individual grantees. 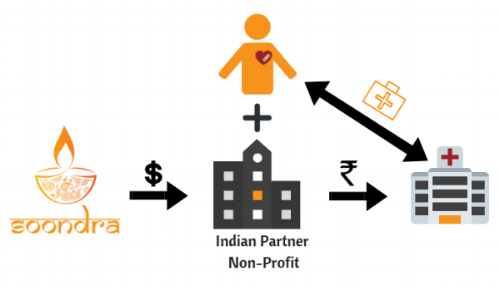 We partner with registered Indian nonprofits that have a valid, current FCRA license. We have many stakeholders: the people who generously donate funds; our partners and medical providers on the ground in India; and the ultimate recipients of the money — domestic helpers, drivers, day laborers, etc. Everyone involved shares a passion for improving healthcare in India and understands the importance of preventing a catastrophic financial burden. Innovation: Our partners have diverse missions; we are a creative organization providing healthcare access in different scenarios according to constituents’ needs. We promise transparency to all stakeholders through a clear line of sight from donation to the actuals paid for the micro-grant. We promise to focus on individuals who lack access to loans for emergencies only. We promise expedient micro-grants, eliminating time difference-barriers with our partners using escrows funds that are released by email approval. We promise accountability by partnering with NGOs with strong positive standing in the community and transparent accounting, governance and funding practices. We promise to track outcomes, to use data to guide our decisions and make strategic choices.